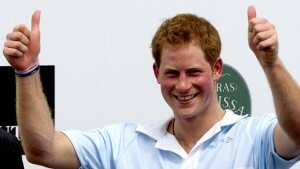 Britain’s Prince Harry Gets Caught With His Pants Down-Oops! Prince Harry gets caught with his pants down and the whole world is talking about it! He’s actually getting more media attention than the two United States presidential candidates. Now some of you might be thinking, “Wow, that’s a relief, isn’t it?” I’m not so sure about that! First of all, it proves what I’ve been saying all along. “I don’t care who you are…A politician, celebrity, royalty, or the nice kid next door…If you do something that you don’t want to potentially ruin your reputation and/or embarrass you and your family (yes, I’m thinking Mother), then don’t do it within range of a camera or cellphone. There is a VERY good chance that you will be caught with your pants down (literally) or doing something else that you don’t want to come back and haunt you in a few hours (think YouTube) or even years later. We live in such a technologically advanced world, it doesn’t take much time for something newsworthy or just plain stupid to reach millions of people. Now of course, there are people who thrive on this kind of attention, like young female celebrities who accidentally spread their legs getting out of vehicles and just (oops) happen to forget they aren’t wearing underwear. I can think of many other examples but I just ate lunch and I’m trying to hold it down! This also goes to prove that what happens in Vegas does NOT stay in Vegas, so if you plan a vacation to what many refer to as Sin City try to behave yourself or wear a disguise! And one last suggestion…Next time you give a party(or attend one), collect everyone’s cell phones and cameras at the door and DON’T forget to pull the blinds down! Amen sister. I tell my kids this all the time. Also, I tell them nEVER EVER to write/do anything that they wouldn’t want read out at church or printed in a major newspaper. This digital world actually gives us less freedom. I agree! Thanks for writing! I agree! Harry is so damn charming that he ultimately gets away with anything he does. Hopefully he’ll learn soon to keep his pants up! Thanks for writing! Those are wise words and I use to tell my kids I’ve got eyes and ears all over this town so don’t do anything you don’t want me to find out about. Thinking before performing the deed is really important these days. You are SO right about that! I appreciate your comment! I wish this was a lesson learned, but I doubt it. I also think everyone should stop this ridiculous stalking of celebs. I want them to have their privacy and then when they want publicity, they will come forward with their ‘news’. That’s really all we need to know, isn’t it? Sadly, when they become celebrities, their lives become an “open book” and everything they do becomes news. A few have died trying to escape from the paparazzi including Prince Harry’s Mother, Princess Diana. What a tragic ending! Thank-you for your comment. As someone who has interviewed a celebrity, I agree wholeheartedly about respecting their privacy. There are many who value those boundaries, and for them I have the utmost admiration. But there are so many celebs today for whom even a nanosecond in the 24-hour news cycle is catnip. I don’t have to name names, we all know who they are. I’m actually a bit surprised that this happened to Harry, but only because you would think he would know better. He’s still young and I’m sure it was the last thing on his mind that weekend! Can you imagine having to face his Grandmother, the Queen, when he returned home. All I can say is “Oy Vey!” Thank-you for sharing your thoughts! What happens in Vegas ends up on Facebook.